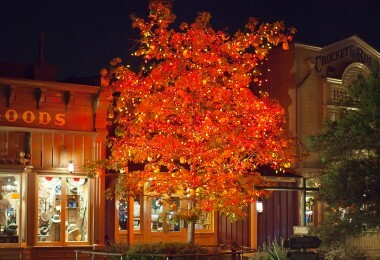 For a foodie, is there any better holiday than Halloween? 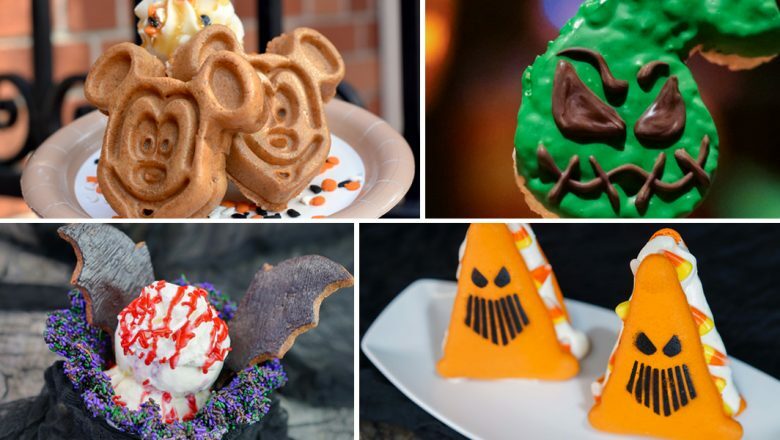 Candy and sweets are the name of the game for this fall holiday, and Walt Disney World and Disneyland Resorts have pulled out all the stops to make this Halloween an absolute treat. See what we’re planning to try below, and make sure to map out your must-eats before your next visit to either resort. Happy Halloween! 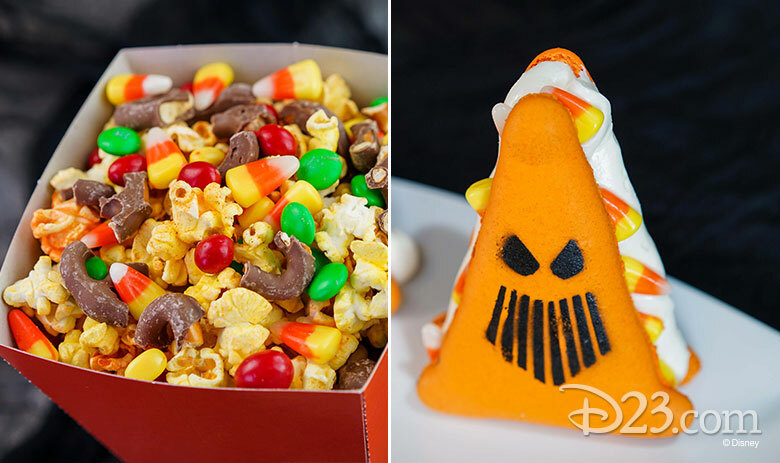 We’re so excited to see Cars Land decked out for Halloween Time and these treats are perfect for snacking on during a visit to Radiator Screams. Up your popcorn game with the Junkyard JamBOOree Mix: Choose a flavored popcorn (a Cozy Cone Motel favorite!) and opt to add nuts and bolts––think M&Ms, candy corn, chocolate covered pretzels. Or, switch gears (sorry) with a Radiator Springs twist on a French macaron, filled with marshmallow buttercream and candy corn. Gourmet donuts are one of our new favorite Disneyland delicacies! The popular Main Street cappuccino cart will get their scare on in a most-delicious way, with donuts inspired by the holiday. Over at Disney California Adventure, keep an eye out for a donut inspired by one of our favorite monsters, filled with marshmallow cream. 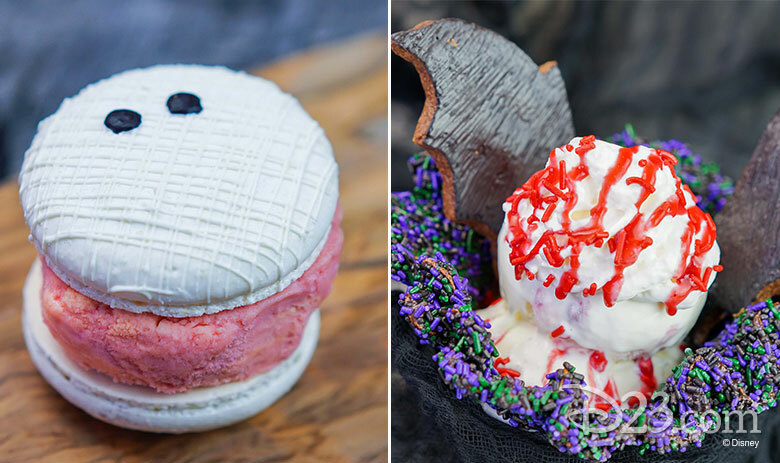 There’s a plethora of options for ice cream––A mummy or spider web-inspired macaron ice cream sandwich at Schmoozies and Clarabelle’s, respectively; a bat-wing sundae (also at Clarabelle’s); or grab a scoop of your favorite flavor in a Halloween sprinkled cone at Gibson Girl Ice Cream Parlor. We love grabbing a take-home treat on our way out of the parks. 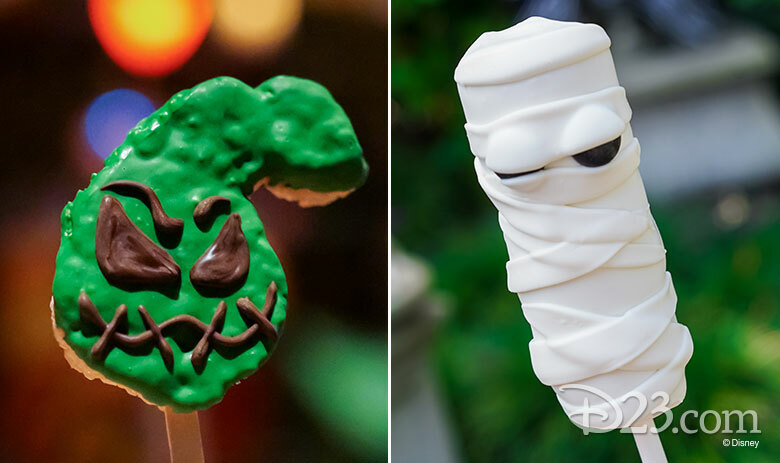 This Halloween Time, snag an Oogie Boogie crisped rice treat, or munch on a mummy marshmallow wand or a spirited candied apple. Head to the Main Street Bakery at Magic Kingdom for a Mickey-shaped Cinnamon Roll, topped with orange icing and a chocolate spider web. 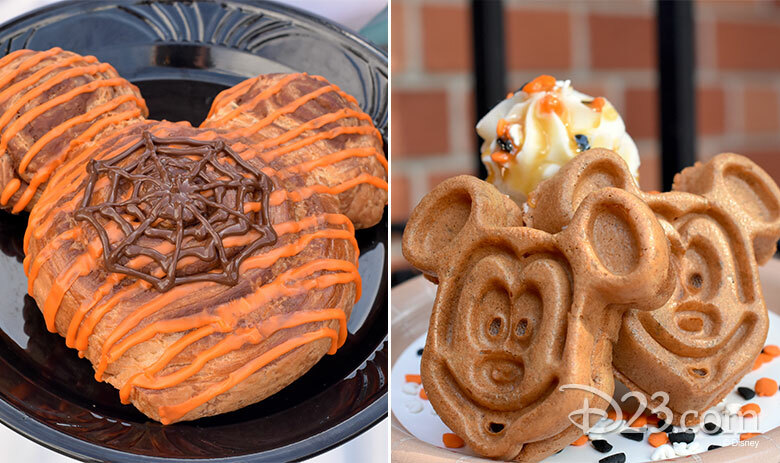 If you’re attending Mickey’s Not So Scary Halloween Party, stop by Sleepy Hollow for a pumpkin Mickey waffle, served with vanilla ice cream, whipped cream, sprinkles, and caramel sauce. 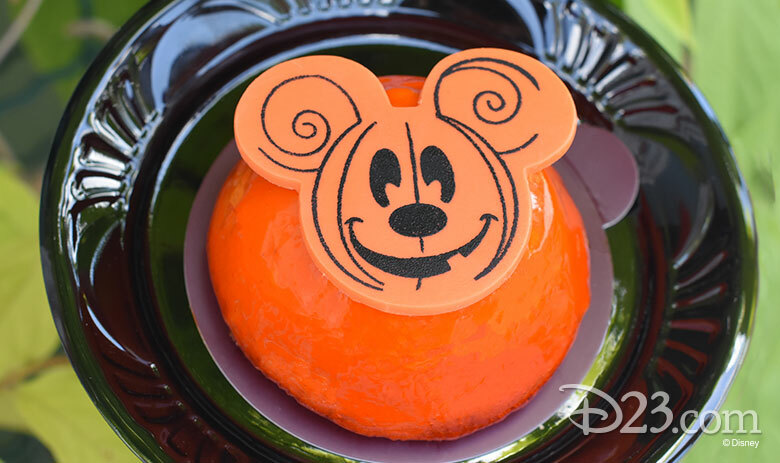 Grab a bright orange Mickey Halloween Cupcake at Main Street Bakery, where orange vanilla buttercream, sprinkles, and a white chocolate scarecrow Mickey top a purple marshmallow fluff-filled chocolate cake. During Mickey’s Not-So-Scary Halloween Party, dig in to a Pumpkin cheesecake dome topped with an adorable white chocolate Mickey at Main Street Bakery or Gaston’s Tavern. 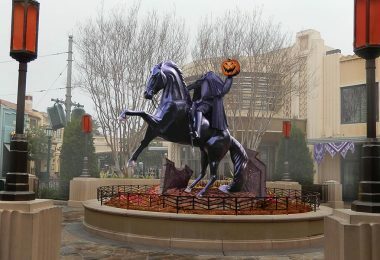 Love the Pumpkin King? 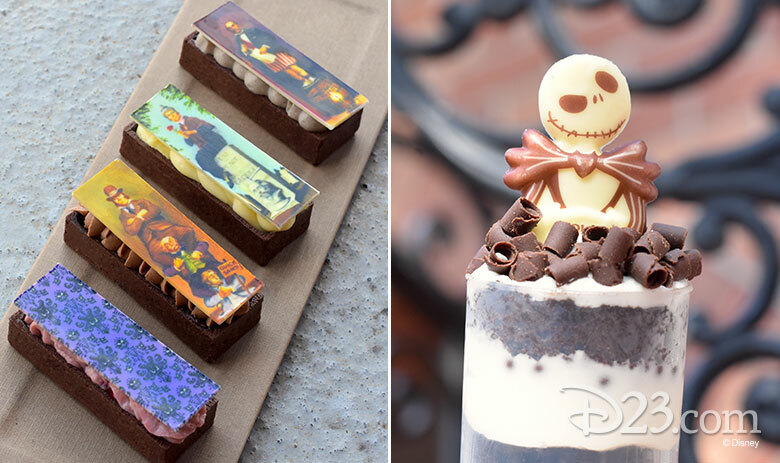 Try his brand-new dessert––vanilla panna cotta, chocolate cake, vanilla buttercream, and a white chocolate Jack Skellington––at Sleepy Hollow. Or, if you dream of becoming the 1,000th happy haunt, try one of these tarts inspired by the Haunted Mansion, found at four different locations throughout Magic Kingdom. 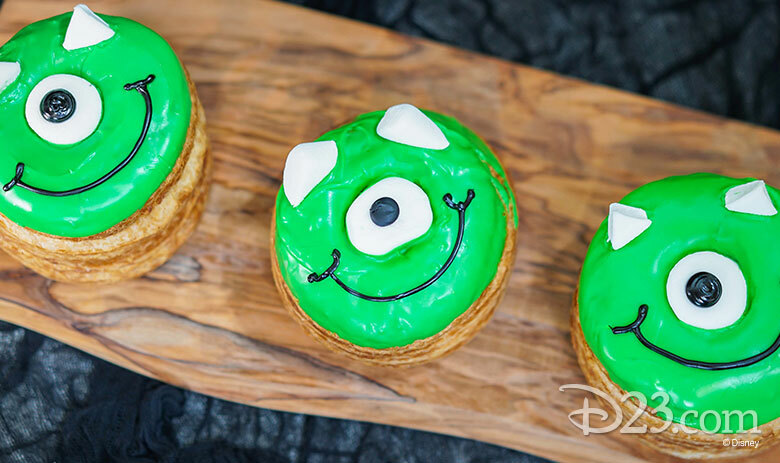 These tasty treats are available only during Mickey’s Not-So-Scary Halloween Party.